Would you like a well-oiled, highly skilled team of technical and process experts to help launch a new program, upgrade your network, or improve business process flow? We have staff members with over 10 years each in the Financial and Human Resources business sectors. If you need assistance setting up new programs, improving existing processes, preparing for an evaluation, and researching ways to maximize profit while minimizing expenses...our team is here to help. We are in the process of launching our new site, so please check back for case studies soon. Custom application created for title companies. Allows customers to place orders online, track those orders, and receive automatic notifications when orders are completed. Job board geared towards craft workers - welders, pipefitters, boilermakers, equipment operators, carpenters, electricians, etc. 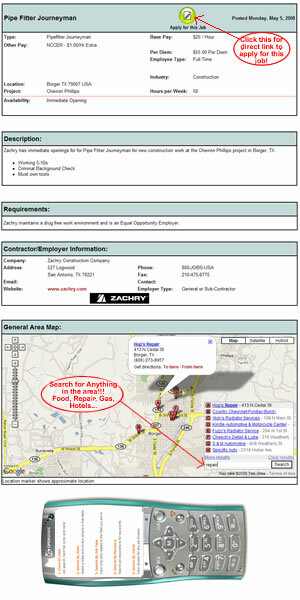 Detailed job search area pulling from 1 database and 1 XML feed. Job descriptions include details about each job, where it is, pay scale, requirements, information about the employer, a map to the work site, and links to apply for the job immediately. Mobile version of the job search and details areas available for all members.